Over the past decade or so, hoteliers looking to create a USP and stand out from the pack have turned their rooms and public spaces into miniature art galleries. Few, though, have devoted an entire hotel to a single artist. In that regard, the art’otel group stands out for its artist-themed properties. 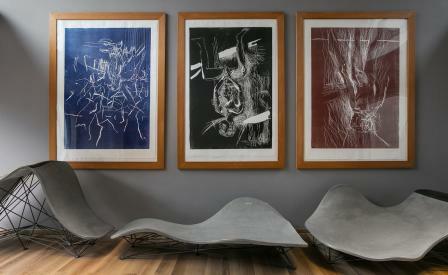 Its freshly renovated 109-room art’otel Berlin Mitte, for instance, is a smorgasbord of Georg Baselitz’s works. Design firm Scott Brownrigg was careful to ensure that everything about the 17th-century building – dismantled from its original location at Breite Strasse 11 and rebuilt in the current location in the 1960s – from its entrance and reception through to the bar, restaurant and the bedrooms celebrates one of Germany’s most celebrated living artists. The references are sometimes subtle, such as the combination of wood and gold and copper, a favourite motif. But the hotel’s haul of nearly 330 Baselitz pieces – scattered through the room and public spaces – is difficult to ignore, especially in the new Upside Down bar and restaurant, the name a reference to the artist’s penchant for upending the perspective of his works. These are nicely set off by Fritz Hansen ’Fayn’ sofas, Axicon pendant lamps, and bespoke concrete benches inspired by Baselitz’s signature.